A popular and regular performer in Queenstown, violinist Cathy Irons is delighted to return - this time with the whole band in tow! 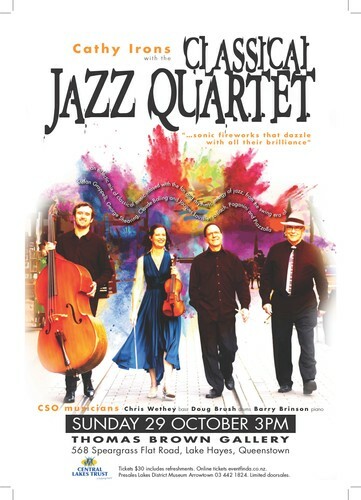 The Classical Jazz Quartet consists of four outstanding Christchurch musicians, Cathy Irons (violin), Barry Brinson (piano), Chris Wethey (bass) and Doug Brush (drums). Combining their creativity and imagination, they enjoy bringing much loved favourites to life with new musical zest. Described as “sonic fireworks that dazzle with all their brilliance” and “characterized by inspirational musicianship,” the Classical Jazz Quartet bring an eclectic mix of classical music infused with the fun and rhythmic energy of jazz. They draw on music from a wide range of styles from the swing era of Stefan Grappelli, George Shearing, Claude Bolling and Jacques Loussier, to their own adaptations of classical works from Bach, Paganini to Piazzolla. With the evocative, sublime expressiveness of Cathy’s violin, Barry’s masterly direction from the piano, Chris's agile upright bass and Doug’s crisp percussion, it will be an afternoon that will keep you smiling into the weeks ahead. The ticket price includes cheese and wine/juice which will be served during the interval. Tickets also available from Lakes District Museum Arrowtown 03 442 1824. Arrowtown Spring Arts Festival concert. Supported by Central Lakes Trust Queenstown. Cathy Irons (violin) performs regularly in the Christchurch Symphony Orchestra (CSO), including roles such as acting assistant concertmaster. She tours concerts regularly throughout NZ. As part of the Tres Cordes String Trio, she toured for Chamber Music NZ and has performed in IceFest, the Platform Festival, the NZ Jazz and Blue Festival, the Body Festival, the Dunedin Fringe Festival, the Chinese Spring Festival and Arts Festivals in Christchurch and Nelson. Further afield, she has performed in Europe, Japan, Australia and South Africa with further invitations for performances in Canberra and Mallorca, Spain (2017). In 2015 Cathy had the privilege of performing on Michael Hill's personal violin, Giovanni Battista Guadagnini, 1755, named “The Southern Star” in its first NZ public recital. With a musical career spanning more than 50 years, Barry Brinson is one of New Zealand's most versatile musicians, with interests ranging from classical piano and concert organ performance, baroque harpsichord, jazz piano, church and cathedral organist and choir singer, choral director, arranger and composer of church music, jazz and close-harmony choral arrangements, performer on theatre organs including accompaniment of silent movies. In the 1990's Barry played piano and keyboards on tour for the Christchurch Symphony Orchestra in Broadway and light concerts, working with conductors, Wayne Senior, Marc Taddei, and the late Russ Garcia. He is a regular accompanist for international jazz singer Malcolm McNeil. Since graduating from CPIT Jazz School in 2012 on double bass, Chris has established himself as a versatile and in-demand musician. Chris’s previous Court Theatre credits include One Man, Two Guvnors, The Mikado and The Early Early Late Show. His professional experience also includes performing with the Christchurch Symphony Orchestra, Showbiz Christchurch, Free Theatre Christchurch and a variety of Jazz Festivals around New Zealand. Chris has most recently been performing with New Zealand’s premier skiffle rock and roll band, The Goldonies, on cruise ships off the Australian coast. For the past 25 years, Doug Brush has built an international career as a percussionist based out of Chicago, and more recently Christchurch. He is an active performer and teacher in many styles of music. Since moving to Christchurch in early 2010, he has performed with the Christchurch Symphony and teaches at a variety of schools in Christchurch including the Ara Jazz School.